EasyCNA.com CNA,Tampa,We Offer Affordable CNA Classes. This Online Course is an Examination Preparation Course for the clinical skills and written test for the Certified Nursing Assistant examination. This online course is a great program for those who either just need to learn the basics to take care of someone at home or for those who are preparing to to take the Certified Nursing Assistant examination. CNA's work in Nursing Homes, Assisted Living Facilities, Home Care, Hospitals and all types of other healthcare facilities. It is a great review for those who have FAILED a CNA Exam / or / simply wants to REVIEW the Clinical Skills. This Nursing Assistant online training porthole will address the aging population of the baby boomer generation. It is being projected that for this generation, more family and friends will be taking on the responsibility of home healthcare for their family members. The Baby Boomer Generation is the people born between 1946 and 1964. This generation has always had an outsize presence as compared with other generations. They peaked at 78.8 million in 1999 and have remained the largest living adult generation. Baby Boomers generation has long been associated with a rejection or redefinition of traditional values. So the tradition of going in a healthcare facility rather than staying at home with family, and the freedom of independence will be a common desire for this very large ageing generation. We have developed this 'home study video course' to teach the masses of family and friends the common "Activities of Daily Living" skills that will be required to assist this aging baby boomer generation. What are Activities of Daily Living (ADL): Activities of daily living are routine activities healthy people do every day without assistance. They are the daily hygiene and personal care items healthy people do for self every day. There are six basic ADLS: eating, bathing, getting dressed, toileting, transferring and continence. The Basic Activities of Daily Living (ADL) Clinical Skills are Universal. This program will HELP anyone who needs to LEARN the basic skills for those seeking to help their family or friends at home. What every your level of need in healthcare, these skills are the very basics of daily healthcare. * 10 Job Title Driven ALL in One. Online Certified Nursing Assistant CNA Test! The Basic Activities of Daily Living Clinical Skills that are Universal. This program will HELP anyone who needs to LEARN the BASIC Clinical Skills /or/ REFRESHES your current Skills Base /or/ for those seeking to just help their family / friends in a home care environment. What every your level of need, in healthcare this is the very basics and patient bed side care. What are Activities of Daily Living: Activities of daily living are routine activities people do every day without assistance. They are the daily Hygiene personal care items we all do every day. There are six basic ADLs: eating, bathing, getting dressed, toileting, transferring and continence. What is a Home Care Specialists ? A Home Care Specialist or Certified Personal Care Assistant is an integral part of the healthcare / medical team. 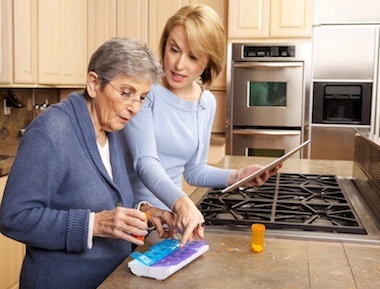 Home Care Specialists help patients of all ages perform the most basic daily tasks. They have direct daily contact with patients, helping them bathe, eat , dress and all other daily hygiene personal care. In some facilities, the Home Care Home Care Specialists responsible for taking a patient's pulse, temperature and blood pressure. Home Care Specialists, are sometimes called nursing aides, and help provide basic daily hygiene care called 'Activities of Daily Living' for patients in hospitals and residents of long-term / shot-term care facilities, such as nursing homes. Help YOU Get A Job Fast! There are many positions in Health Care that do NOT require a License. Certified Nursing Assistant (CNA) Examination Preparation Course Online. * Detailed - Opening and Closing Step by Step Procedures for working in a facility. There are so many career opportunities in healthcare, starting with just helping your family, friends and next-door neighbors with their individual health care needs. Some just temporary as they recover from an illness or surgery. Next, we can expand that to working for health care agencies, and the many different types of healthcare facilities. Starting with private duty Home Care, Healthcare Agencies, Hospice, Assisted Living Facilities, Nursing Homes, Hospitals of all types and Doctors Offices. I have trained works for all of these over the past 17+ years. In fact over 13K students in Florida have used our training programs for Home Care Sitter, Private Home Care, Certified Nursing Assistant, Medical Assistant and Patient Care Technicians in the local hospitals. We have trained them all. Today we continue to expand our usage the internet applications that can be used on computers, tablets, cell phones, and other devices that connect to the internet. It has been our natural progression for 10 years now expanding our integrated programs as the new generation of internet and cell phone applications have become a driving force in education. We started using integrated training 14 years ago and as the usages of these devices have grown and, bandwidth no longer being a problem for videos we find our self now re-designing some our training programs to be just internet based classes. Legal Disclaimer (Students Must Read): The information contained in all online Digital Products, including, and not limited to, on line course, video's, class lecture and documents has all been compiled from sources believed to be reliable at the time and is presented here as a study aid and for general information use only. This information is not intended to replace or supersede the information or procedures outlined in other officially issued study materials or government published acts or legislative documents.